You know how some projects begin with the best intentions, but then begin to languish part-way through, either due to lost interest, lack of time, or change of circumstance, and seem to approach completion asymptotically at best? I'm ecstatic to say that this isn't one of them. When we last looked in on our plucky PriUPS project, the house electrical wiring was complete, and we were waiting for the electrical inspector to bless the installation. This took several weeks ("Why are you calling - that's the contractor's job." "Well, yes, but he's in the Contractor Zone, right now, sir." "OK, I'll be there tomorrow.") With the inspection complete and approval sticker affixed, I've wrapped it up. Clean up the other wiring in the room, in particular the telephone rats nest. Paint over the usual basement scribbles and nasty-looking drywall. 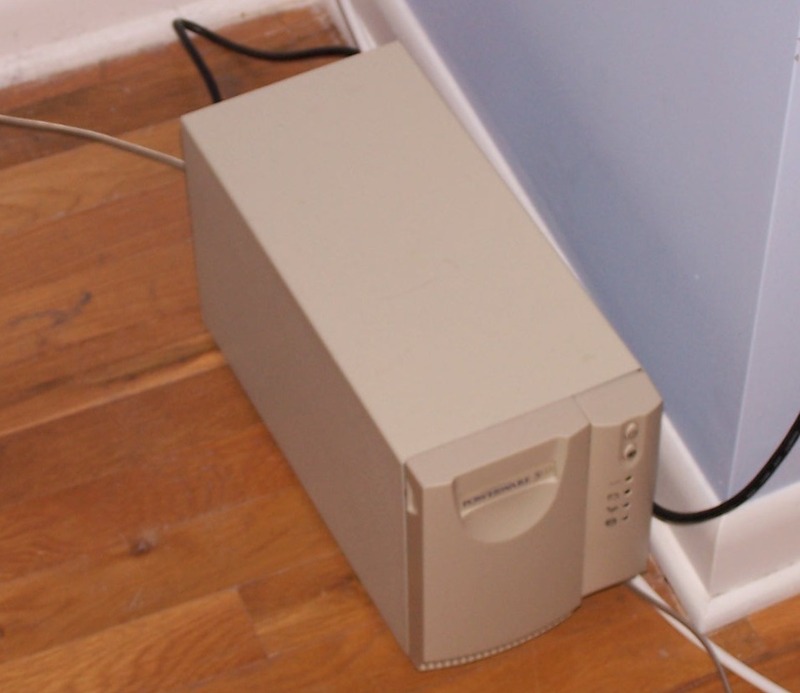 Consolidate the hardware so that the UPS and its pseudopods consume less than half the room. Find a better (i.e., cheaper) DVM for the project so as to not waste a lab-grade HP unit. Install a local computer interface so that the system could be checked and maintained without the network. 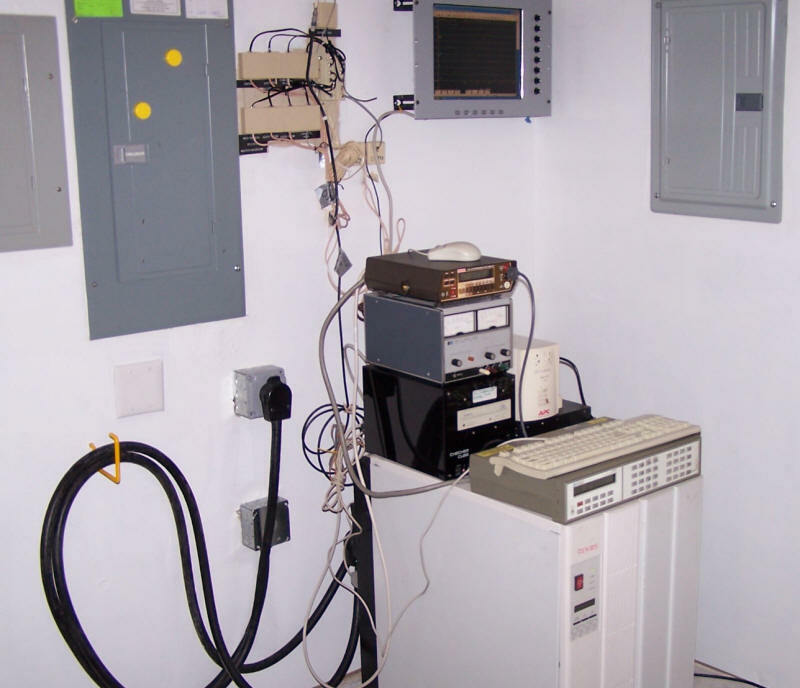 The instrument on top of the meter box is a Keithley DVM with an IEEE-488 remote. Unlike the lab-grade HP unit in earlier photos, it only measures the battery to the nearest volt. I can accept that sacrifice ($46 on eBay, less than 1/10th the cost of the HP). The monitor is an ordinary 15" LCD mounted in a 19" rack panel on the wall and connected to the cube computer under the meter box. The system in the photo is actually a lot more complicated than it needs to be. In fact, if everything other than the junction box were swept off the UPS there would be no operating repercussions at all; I would just be unable to fulfill my compulsion to have realtime data on every desktop every minute of the day and night. I grow less concerned about this as the system operates continuously, month after month, faithfully recording AC voltage, battery voltage, and any power glitches. There has been only one outage since startup. We were sitting down to Thanksgiving Day turkey when there was a power failure. It seems a tree had fallen on a power line a few hice down. But only some lights went out - those connected to the UPS remained on, I connected the Prius, and we enjoyed a very nice dinner indeed. There hasn't been so much as a line glitch since then! One cleanup item was the restart superquirk issue. An eBay acquisition, a small 230V UPS, resolved it. The UPS at the left puts out 230V at up to 1kVA. If the big UPS needs to be restarted, the adapter at the right lets the 50A plug mate to the 10A cable coming from the UPS. Restart is accomplished by shutting off all the breakers in the emergency panel and connecting the big UPS to the small one, which is able to start on battery power alone. 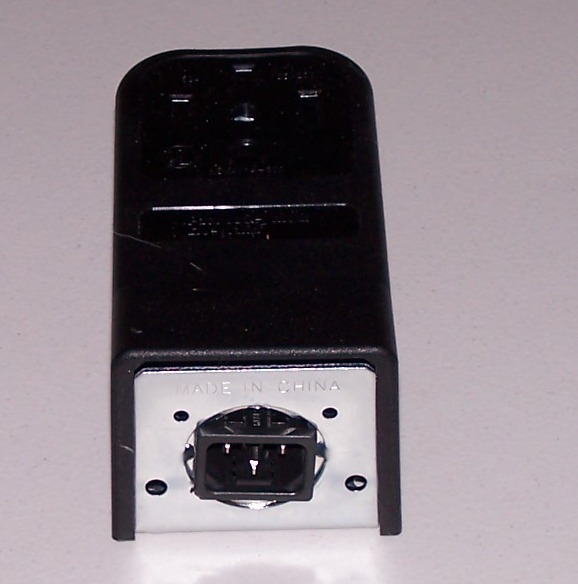 Once the big UPS is running, the small UPS can be disconnected and the breakers restored. Another issue was how to handle a UPS failure. I slightly modified the big UPS to add a 50A connector to its rear panel to be used in lieu of permanent wiring. In the top photo you can see the UPS plugged into the mains supply; the bottom electrical box supports a dedicated cable connected to the socket on the UPS. In case there is a UPS failure, I can simply unplug this dedicated cable and plug it into the outlet box above it. Doing so completely bypasses the emergency power system. This may be the last hardware "update." There's really nothing to be done except to wait for a real power failure and gloat about having electricity. Does this mean that PriUPS will fade into even greater obscurity? I hope not. In addition to the nuts and bolts of the project, I've done a bit to publicize it. Because hybrid vehicles have gotten so much press during the 2005 version of the oil crisis, I've had the opportunity to pester and occasionally correspond with members of the media. PriUPS has turned up in a number of places on the internet, and in various blogs. While I have acquired only a few proselytes, I think a healthy if sporadic discussion of the concept has gotten started. Consistent with this, I've noticed that web "hits" on this site have increased by a factor of almost ten in the past few months, and the volume of correspondence, while not overwhelming, has been commensurate and encouraging. It continues to be my opinion that using hybrids for emergency power serves many needs of the country, of which individual gloating is just one. By doing an internet search on PriUPS, I have found that many people agree, many disagree. In the way of internet discourse, the discussion is frequently ad hominem, but my integument is sufficiently robust to discount that aspect. More importantly, I have had useful suggestions from a number of people, and well-considered arguments, pro and con, about the project's value, of which I remain convinced. I could just drop it here. "I've got mine." But I don't think I shall. For one thing, this web site "just grew" and isn't as coherent as it might be - perhaps I'll get sufficient ambition to organize it a bit better and update some of its tentative beginnings. For another, enough issues have been raised that it might be worthwhile to have an online discussion area devoted fairly strictly to the hybrid-as-UPS concept. So give me a few (days|weeks|months) to catch up on my reading, get my moonbounce beacon back on the air, and pester the odd journalist.